Country Living awaits in this lovely 2890 SF home on OVER HALF AN ACRE near the end of a Cul De Sac in the sought-after community of LAKESIDE GROVE ESTATES. 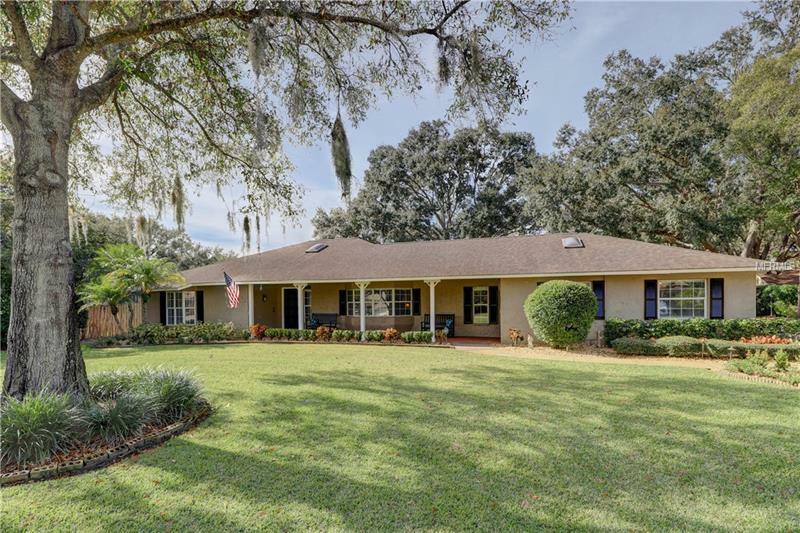 This UPDATED SPLIT FLOOR PLAN home offers 4 BR/2.5 BA/2 CG /2 Carport Pool and “FLEXIBLE LIVING OPTIONS” including a FIRST FLOOR IN LAW/GUEST SUITE! Featuring over $87000 in SELLER UPGRADES this home will surely IMPRESS. Chef’s kitchen UPGRADES include Raised Ceiling Lighting SS Appliances Granite Counters Tile Backsplash O/S Center Island with custom cabinets + Ceramic Tile Floor. Select HURRICANE DOORS and WINDOWS w/lifetime warranty. Baths updates including Mosaic tile accent wall jetted tub lighting & mirrors. Family Rm w/Wood floors Stone F/P and French Doors leading to the Outdoor Entertainment Area. EXTENSIVE Exterior Lighting updates including up & down lighting Front and Back. O/S Laundry room with generous counter top space + New cabinets. All BR’s are Oversized. Newer Custom Blinds Water Filtration System WELL Pump and motor + 250 Gallon Water Tank w/warranty. Exterior & Interior Painted (2011.) OUTDOORS relax under the covered Lanai and ENJOY the newly resurfaced Pool w/Fibre Tech finish (25 yr. Warranty) remote controlled LED lighting in pool cage low profile Edison Lighting + Pool Re-screen. Detached Garage + attached 2 Carport and Room for YOUR RV and/or BOAT! TOTALLY PRIVATE!!! Comes with SERENE Lakeviews from the Covered Front Porch! NOT IN A FLOOD ZONE!